Well, it’s been a week since I went and saw the fantastic Bohemian Rhapsody. I loved it. I am going to go and see it again as soon as I can. I am sure I have mentioned this already on social media, but, it brought so many fabulous memories back. I had something forwarded to me during the week which again, I thought was nice. It was one of the first photos I took of Freddie. Along the side of the photo was the story of what happened when we met. This was under the stage at Hyde Park, London in, I think, 1976. I need to actually sit in a darkened room and really concentrate on that day (and others) and I will then be able to recall some of the other things that happened back in those days. Or, it would be easier if I actually went and got out my old diaries and read them. Yes, that would be a help. I was at school and had decided that I wanted to be a photographer. I was finishing off my exams and I started looking for a job. I opened up The British Journal of Photography and looked through the adverts. One just jumped out at me. It looked exciting and they were paying £11 per week, woohooo! Now, I was about 15 and yes, we could leave school at that age here in the UK in those days. I phoned the number in the advert and the company looking for a messenger in their photo library was Fox Photos Press Agency in Farringdon Road, London. I recall that the man who I spoke to was Tom Smith. I got a train straight into London and met him. He gave me the job straight away. On my first day working at Fox I met a girl who also worked in the library, her name was Shirley. I told her I wanted to be a music photographer. She said, well, you had better photograph Queen then! All she ever spoke about was Queen. So, I took her advice and started to keep an eye on them and I tried to find out where they were playing and touring. It wasn’t easy in those days. No mobile phones, no internet, no facebook, no twitter. Just music papers and fan clubs. So, when I had the chance to stumble upon them I did. Well, I am so glad I did get to work with them. What a band, what musicians, what incredible songs. I got myself a little bit involved with them when they were managed by John Reid. He was always lovely to me. At the time, he was also managing Elton John. I spent a bit of time with them through the late 70’s and early 80’s in the US. They were fabulous times. I still do work with Queen and Brian. In fact it was through Brian that I was asked to work with Nelson Mandela and his 46664 charity. 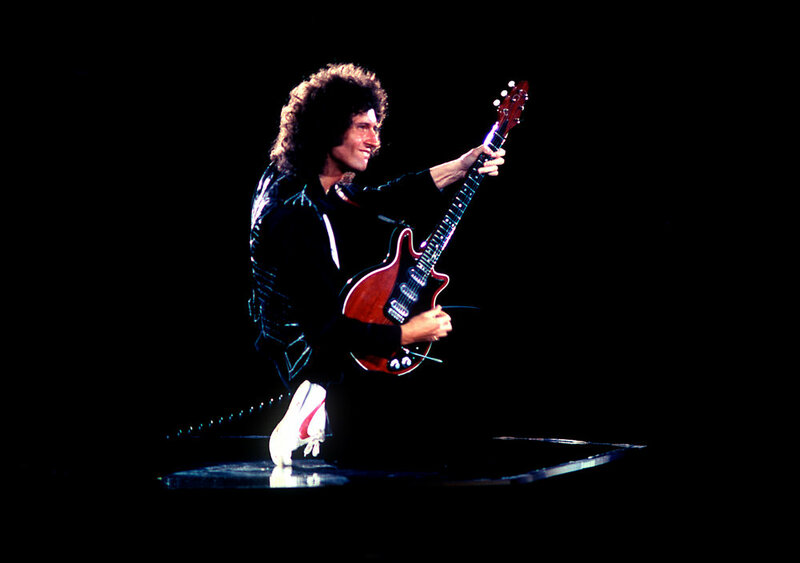 One of the things we did was very Queen based, although very sadly, now without Freddie. It was 200 miles North of the Arctic Circle, in Tromso, Norway. Here is a shot of the rehearsals up there. 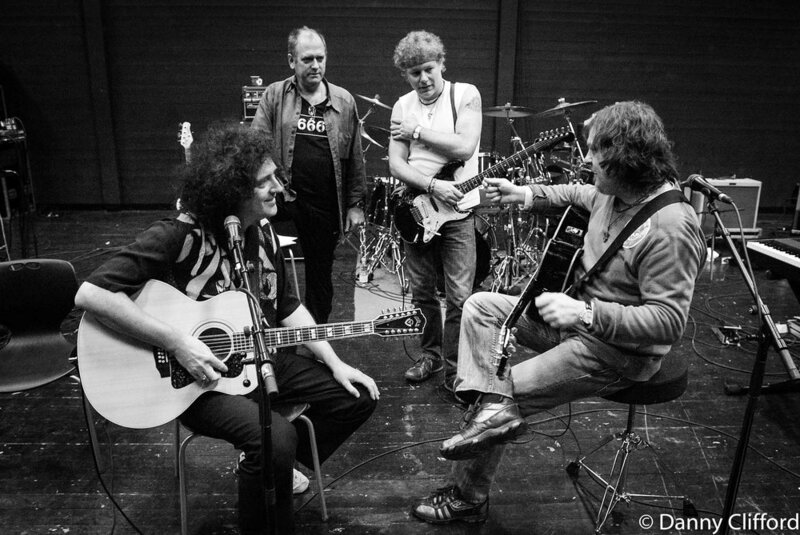 Brian was rehearsing with Zucchero, Jamie Moses, & Spike Edney (SAS Band). The man running the show was, for those of you who have seen Bohemian Rhapsody, Miami Beach himself.. Yes, that really is Jim Beach, Queen’s manager. And here he is being slightly camera shy.. Here is a shot of Brian on stage with Freddie on the screen. I think this was around 2005 and funnily enough, it was where it all started for me, Hyde Park..